Softball Struggles Over Spring Break | The Gettysburgian. Sophomore Sarahrose Jonik was the first on base for the Bullets in the first game against the Yellow Jackets Saturday (Photo Courtesy of David Sinclair). 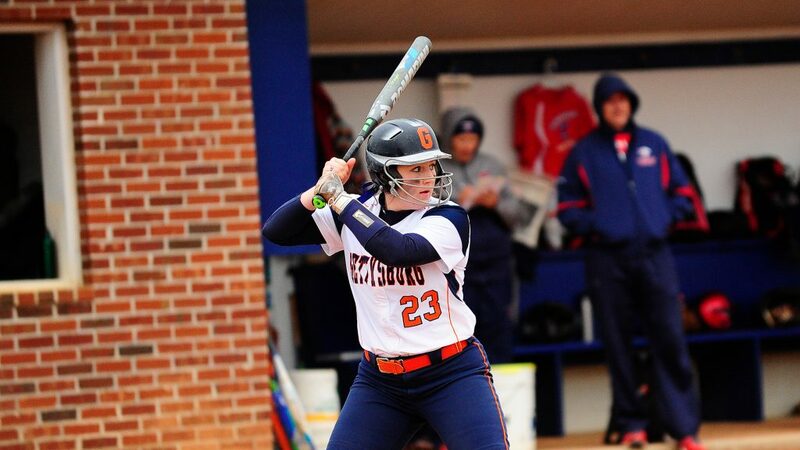 The Gettysburg College softball team experienced two tough losses in a double header versus Randolph-Macon College in Virginia Saturday. The Yellow Jackets of Randolph-Macon (15-1) racked up a total of 21 runs of 32 bases and a pair of homeruns in the second contest to defeat the Bullets (3-9). The Yellow Jackets, ranked 12th in the NCAA Division III polls, won the opener 8-1 before taking the nightcap 13-0 in five innings. The double-header concluded a week on the road for the Bullets. On Gettysburg College’s scheduled spring break, the lady Bullets travelled to Virginia and South Carolina to compete in 10 games against nine schools. At the conclusion of these games, the Bullets finished the week 7-3. Gettysburg was the first on the scoreboard for the day, when first-year Shelby Baker’s hit brought sophomore Sarahrose Jonik back to home plate. Jonik had been walked as the first player at bat. Baker, a first year catcher from Ohio, contributed offensively in nearly every spring break competition. Yet Randolph-Macon would return to score three runs during its turn at bat in the first inning. While the Yellow jackets brought five more players home in the bottom of the third, the Bullets were unable to score any more runs in the first game. Randolph Macon pitcher Candace Whitmore gave Bullet hitters a hard time, as she threw nine strikeouts and allowed only a single run on six hits. On the Bullets’ side, sophomore McKenzie Somers and junior Morgan Clauser both contributed two strike outs. Clauser allowed only two hits, no runs and fouled out two Yellow Jackets in the final three innings. Randolph-Macon opened the first inning of the second game with Harley Jones hitting a homerun into left field to bring home two of her teammates. From there the Yellow Jackets would keep the runs coming while preventing the Bullets from scoring any. Baker was the only Bullet to manage a hit against the Yellow Jackets in the second game. The Bullets would not earn a base off a hit after the first inning. Gettysburg College Softball Head Coach Annette Hunt-Shepherd feels no differently about her team’s future following the pair of tough losses. Hunt-Shepard enters her fifth season as the Gettysburg head coach this spring. As the season fully commences with Centennial Conference competition, the Bullets welcome seven first-years to the squad who are just settling into collegiate play. The team also welcomes back senior pitcher Aileen Riley, who is a twice-recognized All-Conference player, senior shortstop/second baseman Stephanie Leonardo and senior All-Conference first baseman Wendy Folfas for a final season in orange and blue. Coming off of a 28-14-1 season, the Gettysburg softball team has built its reputation as a consistent contender in Centennial Conference play, while maintaining a rigorous, non-Conference schedule including ranked opponents like Randolph-Macon. The Bullets are currently ranked 23rd in the NCAA Division III poll, and they have played in seven Centennial Conference championships in the past 12 years. Moving forward, Coach Hunt-Shephard says her team will be trusting in their hard work. “We are a process-oriented team and while the results haven’t been what we had hoped we are currently working towards continued improvement” said Hunt-Shepard.